Welcome to another installment of LiveAnalysis! Today we have the fifteenth meeting between World No. 1 Serena Williams and World No. 2 Victoria Azarenka. Serena Williams has dropped only one set in Cincinnati (against Bouchard in her 1st match), though it could be argued that she should have dropped at least one to Li Na in the semis. Azarenka has matched that feat, by dropping her only set of the tournament to the somewhat resurgent Jelena Jankovic in the semifinals. Click here for the H2H between these two (which Serena Williams leads 12-2). Do click on Bobby’s link below – there’s quite a bit of neat information there. “Entering the Cincinnati final, Williams is 29-2 on hard court so far this season, and Azarenka is 24-1.” This little tidbit is why I’m completely against the tennis habit of not counting withdrawals as losses, particularly when a player has already played a match in a tournament. When you read quote above, you’d think Azarenka has only lost one hard court match all year, right? You’d think she’d have won a bunch of titles, given the sheer number of wins. But no – she’s won only two (one of which is the Australian Open). That hardly equals to 24 wins and just one loss. 1. Can Victoria Azarenka serve well enough to survive? The reigning Australian Open champ has been struggling with her serve (and an injury to her upper body) since the hard court season started, and that’s a particularly bad problem to have when you’re playing Serena Williams. 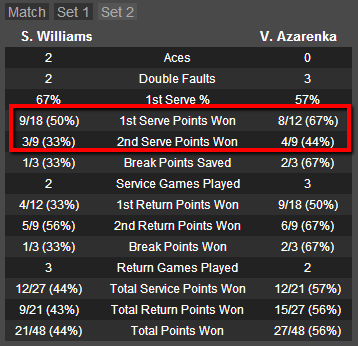 One of the main reasons that this H2H is so lopsided is the mismatch between Azarenka’s 2nd serve and Serena’s return of serve. If Azarenka is donating double faults and misses first serves constantly, this will be a very, very short match. 2. Can Serena dominate with her serve? If the answer ends up being “yes,” again, this will be a short match. Azarenka MUST make every Serena service game a battle. Easier said than done. 3. Will Azarenka be able to get Serena to hit on the run consistently? The World No. 1’s footwork tends to deteriorate if she’s being pushed from the baseline. If Azarenka can put Serena in uncomfortable positions during baseline rallies, good things will happen for her. Remember to refresh this page often, as I will be providing game-by-game analysis throughout the match! First Set – Victoria Azarenka will serve first. 0-0: Azarenka starts with a DF. Bad omen? Another DF follows. A deep return by Serena triggers the error, and she’s down 0-40. Azarenka then survives Serena’s deep, penetrating return, but a BH DTL ends up handing the break to Serena. 1-0, Williams: Serena holds at love in little over a minute. She’s yet to lose a point in this match. Ominous start for Azarenka. She didn’t win a point on serve, and then her returns were easily handled by Serena. 2-0, Williams: Serena goes for a big 2nd serve return, but misses. Azarenka has won a point! Moments later, she fires an ace and she’s up 40-15. The pair exchange points, and rather surprisingly, Victoria ends up holding serve. Serena’s footwork in that last game was beyond suspect. Got away with it a couple of times, but more often than not, this will be a problem. Azarenka’s challenge is to exploit these opportunities during Serena’s service games. As usual, easier said than done. 2-1, Williams: Serena once again is untroubled at serve, and holds serve to 15. Azarenka is having quite a bit of trouble making the World No. 1 move – Serena is being able to just take one or two steps before every shot – even when more are necessary. 3-1, Williams: Azarenka dumps a tame FH into the net, and she’s down 0-40 again. Then, a deep return sets up a short ball for Serena, which she calmly blasts away into a corner. Serena breaks again! This is comically easy for Serena, who is not having to move around the baseline to dominate. Azerenka’s shots just can’t find the corners of the court. 4-1, Williams: Serena double faults for 30-all, but ends up holding shortly after anyway. Still not moving her feet much, still dominating. 5-1, Williams: Azarenka finally gets Serena on the run…and ends up losing the point anyway, as Serena actually moves her feet to track down a BH DTL and then a dropper. Surprisingly enough, Azarenka ends up holding after a SW.
5-2, Williams: Serena fires an ace up the T for 40-0, and triple SP. A quick rally later, Azarenka can’t handle her pace up the middle, and the set is over. First Set to Serena Williams, 6-2. Second Set – Victoria Azarenka will serve first. 0-0: Azarenka finds some good serves, and ends up holding easily to 15. That hasn’t happened often in this match. 1-0, Azarenka: Finally, some competitive points. Serena puts together a little clinic of net anticipation, as she reads Azarenka’s CC FH pass perfectly. She then botches a FH and DFs, so it’s Deuce on her serve for the first time in the match. However, she fires an Ace up the T for GP. Azarenka then gets Serena to end up doing splits, and it’s Deuce #2. Another Ace is followed by another FH UFE, so it’s Deuce #3. Serena DFs for the 4th time in the match, so it’s Azarenka’s 1st BP of the match. Then a great 2nd serve return by Victoria hands her the break! 2-0, Azarenka: Victoria rolls to a 30-0 lead, but Serena, fed up with herself, fires a CC BH winner to level it at 30-all. She continues the good run of form to boss Azarenka around the baseline, finishing with a CC FH winner. BP for the World No. 1. And then, a God-mode point by Serena, who jumps around the court and fires away shot after shot like a video game boss. She finishes with an outrageous CC FH winner from the opposing doubles alley to break. Insane. From 30-0 to Azarenka she started shouting at herself, hit 4 winners in a row and broke back. Just like that. 2-1, Azarenka: Serena is flying now. She’s moving her feet, and timing the ball beautifully. Shot selection is back to being immaculate. It’s 40-15, but then a very lucky letcord, and a great I-O BH make it Deuce. Serena then botches a 2nd ball FH, so it’s BP for Azarenka. What follows is superb play by the World No. 2: she fends of a good body serve, and then goes on the offensive with two great FHs. Ends up forcing the error, so Azarenka is up a break again! Victoria is competing, like any proud champion would. She’s also finding the open court more frequently now, and her returns aren’t as easy to handle as they were earlier. Serena’s top flight moment was brief, apparently. 3-1, Azarenka: Azarenka DFs 3 times, and finds herself down 30-40. Luckily for her, a BH up the middle skids off the baseline, so it’s Deuce #1. The letcord comes into play again, as it clips a Serena return and makes it impossible for Victoria to chase down. BP for Serena again. Would you believe it…another letcord! This time, Azarenka does have time to chase it down and put away the short ball. Deuce #2. SW into the body, and Azarenka has a chance to escape. Which she does, crucially. 4-1, Azarenka: Serena was once up 30-15, but soon after, she’s down 30-40. Azarenka plays the BP correctly, but her I-O FH misses badly. Unfortunate execution. Deuce #1. 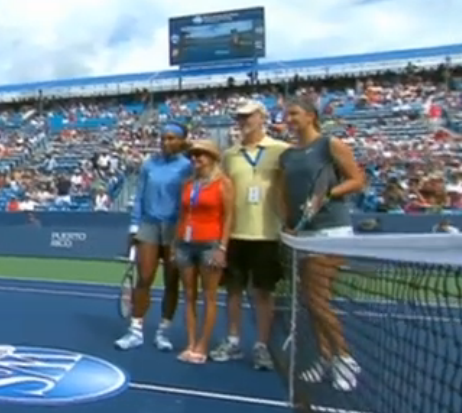 Drama ensues, moments later, as Azarenka seems to have hit a BH CC winner, which is called out. Hawk-Eye shows it to be correct, yet the chair umpire (Cicak) has the point replayed. An absurd call, since Serena didn’t touch (or have a play on) the shot. Azarenka hooked. Chair umpire with horrible call. Call well after Serena allowed ball to pass, Williams offered no shot as well. The women played 30 points in that 18.5 minute game. 4-2, Azarenka: Rather unsurprisingly, Serena goes up 0-40 in about a minute. Azarenka fends off the 1st BP, and Serena misses a FH DTL well wide for the 2nd. One left for Serena to get back on serve. Now Serena botches another FH badly. SW for Azarenka, and she suddenly has a GP. Which she converts, after a SW.
Tactical Update: Azarenka is finding the open court more frequently, and doing so with better shots. Serena finds herself often on the run, which is the key to Azarenka’s chances in this match. 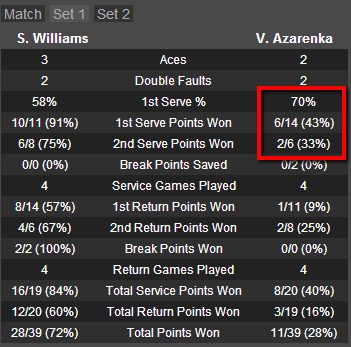 Also, Azarenka is doing a better job of getting her returns away from Serena. 5-2, Azarenka: Serena’s erratic footwork sees her slice a BH well long, and she’s down 30-40, SP. It is converted via a gorgeous BH dropper. Such a classy, pretty shot. Second Set to Victoria Azarenka, 6-2. Third Set – Victoria Azarenka will serve first. 0-0: Azarenka gets off to the best start possible – a very simple love hold. 1-0, Azarenka: Serena’s FH seems to have lost its way. Not the backhand, though: she puts away a short one, and it’s 40-30. A Serena UFE ensures a Deuce, but then Victoria can’t get a rushed BH over the net. A deep return forces Serena’s error, so Deuce #2. Moments later, Serena holds after Hawk-Eye says Azarenka’s BH smash was out. Would’ve been an awesome shot had it landed in. 1-1: Danger for Azarenka, as she misses her favorite shot, a CC BH wide, and she’s down 15-30. Serena returns the favor with the same shot, so it’s 30-all. Serena then goes on the warpath with a FH DTL, and ends up forcing the error. BP for Serena. Azarenka saves it with a string of great shots into the corners, which allow her to finish with a simple putaway at net. SW, and she can escape this game. She does, behind a good serve and two even better CC BHs. 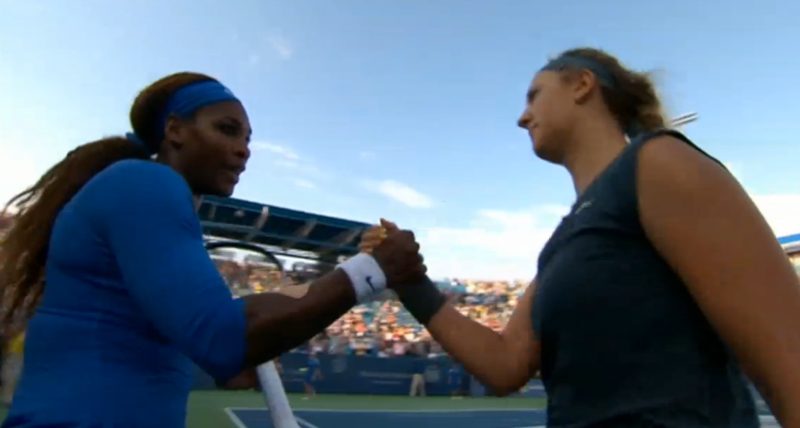 2-1, Azarenka: It feels weird to type this, but that was a rare love hold for Serena. Hasn’t had one in a while. 2-2: Anything you can do, I can do better…or just as well. Azarenka comes up with a love hold herself. 3-2, Azarenka: Victoria gets a great return in play, and Serena casually swats it way long. Bizarre. Anyway, it’s 0-40 for Azarenka. 1st BP is saved via a monster serve. But Azarenka gets in a gorgeous I-O BH 2nd serve return, forces the error, and gets the break! 4-2, Azarenka: Serena blasts a BH DTL return winner off a feeble Azarenka 2nd serve. Her problem? That just makes it 30-15. But now 30-all, as Azarenka botches a short, midcourt FH. However, a SW gives Azarenka a chance to hold. Serena nixes it with a great CC FH, so it’s Deuce. A great FH return by Serena forces the error, and it’s BP for Serena Williams. The pair play a very long rally, and just when Azarenka seemed to have an edge after a great BH DTL, Serena fires back with her FH, forces the error, and gets back on serve! 4-3, Azarenka: Serena avoids the momentum swings of the second set, and consolidates her break with a hold to 15. 4-4: Serena, as she’s done in very, very short bursts in this match, plays one of those points where you just shake your head and say “too good.” She’s up 0-30, but Azarenka holds her nerve and levels the game at 30-all. And then, disaster for Azarenka – she gets tight on a midcourt FH, and dumps it into the net. Crucial mistake, as it sets up BP for Serena. Victoria then seems to have hit an outrageous I-O BH winner off a great Serena return, but the latter’s challenge proves it to be out. Serena will serve for the match! Suddenly Serena looks like the fastest player in the top 10…. 5-4, Williams: That might have been the rally of the match (which is not saying much), but it ends with Azarenka completely outmaneuvering Serena. 0-15. A great return catches Serena flatfooted (a frequent occurrence today), and it’s 0-30. SW into the body, and it’s 15-30. Azarenka gets a good return in play, and keeps moving forward. She forces the error, and is up 15-40. A simply magnificent return that lands smack on the baseline lands Azarenka the break! More great returning from Azarenka. More pitifully disinterested footwork from Serena. 5-5: Azarenka keeps fighting, and holds to love rather emphatically. It's been a long time since I've seen Serena look this "over it" in the final rounds of a tourney. 6-5, Azarenka: Serena fires an ace, and has 3 chances to hold. She doesn’t move her feet after her serve, and that’s just not good enough against Azarenka – 40-15. SW, and we’re into a third set breaker. Final Set Tiebreaker! Victoria Azarenka will serve first. 0-0: Serena goes for a huge 2nd serve FH DTL return…and misses wide. 1-0, Azarenka: Wonderful stuff from Azarenka: a great return is followed by a FH DTL approach, and she finishes with a classy volley at net. Minibreak. 2-0, Azarenka: Serena stops the short rut, as she fires a CC BH past a lunging Azarenka. 2-1, Azarenka: For about the 1084085098th time, someone hits the letcord. It’s Serena now, and her FH sails wide. 3-1, Azarenka: An absolutely gorgeous CC FH 2nd serve return by Serena forces the error. Marvelous shot. Minibreak. 3-2, Azarenka: 2nd serve. Gorgeous return is followed by a great BH DTL, and Azarenka ends up at net once again. Minibreak. 4-2, Azarenka: 2nd serve. Azarenka gets in a fantastic FH return up the middle….and then sends another FH into the net. Bad, nervy UFE. 4-3, Azarenka: Slight tactical error by Azarenka, who leaves a CC BH short…and Serena pounces with her own great BH DTL. Minibreak. 4-4: Another short, FH UFE into the net by Azarenka. Horrorshow for her, at the worst possible time. Minibreak. 5-4, Williams: 2nd serve. A wild point ensues, with Serena hitting a dropper that seemed to land wide. Azarenka tracks it down, hits the counter DTL, and Serena can’t get the reply to land in the very open court. Minibreak. 5-5: And….a DF by Serena. Minibreak. 6-5, Azarenka: An absolute monster CC BH return by Serena cannot be handled by Azarenka. Minibreak and MP saved. 6-6: POINT OF THE MATCH. The rally is brutal, from side to side with loads of depth, and it ends with a simply incredible volley by Azarenka. MP #2 for her. 7-6, Azarenka: The rally seems to just have started…and it’s Serena’s FH that ends tamely in the net. A fitting end to this strange, strange match. Game, Set, and Match to Victoria Azarenka, 2-6, 6-2, 7-6 (6). When you have a significant final that involves the World No. 1 against the World No. 2, and this final ends in a thrilling third set tiebreaker, you’d think we had one of the best matches of the year in our hands, right? What if I told you that this match also had an 18-and-a-half minute, 30-point game in the second set? Battle Royale, no? Victoria Azarenka, who deserves all the praise she’s getting for this win, was far beyond mediocre in the first set. She couldn’t hold serve, and all her returns were handled quite easily. What I found fascinating in that first set was that Serena seemed completely uninterested in properly moving her feet in order to reach shots that landed more than two steps away from her. Fortunately for the reigning French Open champion, most of Azarenka’s shots were landing in that two-step radius anyway, so not much effort was needed to seal that set with the convincing 6-2 scoreline. But Azarenka was far from mediocre in the second set. And in the third. I was impressed by Azarenka’s determination to go down swinging, but also by her ability to raise her game to make that fight worthwhile. You can fight all you want, but if your shots stink, you’ll still lose very quickly anyway. Once the second set started, Azarenka was all of a sudden finding better serves. All of a sudden her returns were pushing Serena behind the baseline, or yanking her to a corner. All of a sudden she was using her trademark down-the-line shots and penetrating cross-court bombs to get Serena on the run, forcing the World No. 1 to take way more than two steps to reach a shot. More impressively, Azarenka hit some pretty solid volleys (part of her efforts to move forward behind great approach shots), along with a simply spectacular one in the third set breaker. 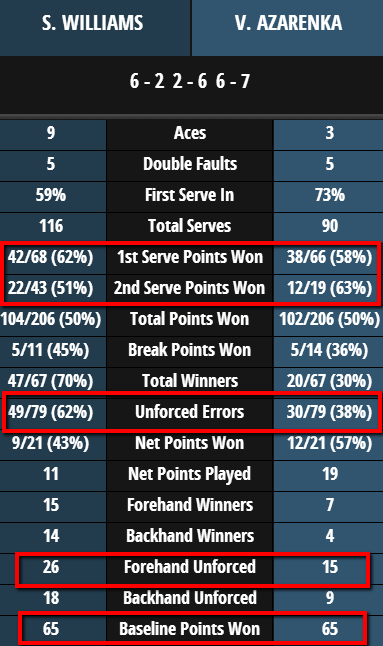 And yet, all these good things seemed to be for naught, as Azarenka failed to convert numerous double-break chances in that endless 4-1 game in the second set, and found herself down 0-40 in her next service game. Yet Victoria’s will seemed untroubled, and soon enough she had survived that game and broken again to force a decider. You can’t help but be impressed by the way Azarenka handled adversity in this match – and she had plenty of adversity to deal with: first she got manhandled in the opening set. Then she almost botched a break lead that should’ve been a two break lead in the second. In the third set she found herself having to break Serena’s serve just to stay in the match at 4-5. Lastly, she was in the midst of a full-blown Tomas Berdych tribute, with a couple of nervy forehand unforced errors in the third set breaker that put this victory in serious danger. And yet, Azarenka ended up taking the ugly trophy, but most importantly, a win over Serena Williams ahead of the US Open. Resiliency was thoroughly rewarded. Now, let’s talk about the World No. 1. It’s easy to write something like “I was completely baffled by Serena’s attitude today.” It’s been written many times before. Just when you thought the 16-time Slam champ was completely detached from the proceedings, she would chase down two impossible shots and finish with a flourish. That would be followed by three or four points in which she would stop moving her feet and instead resort to lunging into shots that would miss by a sizeable margin. Serena was never in Despair mode: she oscillated between I’m Done With This mode and I Still Want To Win This, Dammit mode. She roared, she yelled at herself, she rolled her eyes, she showed no emotion for long stretches, and then she was all smiles calling the winner “Miss Vika.” She had horrible footwork, she had impeccable footwork. She served aces, she double-faulted. She drilled great returns by Azarenka, and she dumped simple ones into the net. Serena had 3 chances to get back on serve in the second and roll from there. She served for the match in the third. And yet, she lost. She was responsible for 5 unforced errors in the first set, but 44 in sets 2 and 3. Most damning of all, Serena Williams, one of the great returners of serve the game has ever seen, somehow allowed Victoria Azarenka to win 63% of her 2nd serve points. I have no idea what’s going on inside Serena Williams on a given day, and I guess that’s why I enjoyed the controversial Rolling Stone profile (more like a snapshot, really) of her: she’s so many things, all of the time. Sure, some might make you cringe. Others might make you laugh. And you may wish that a few of them stayed longer in our view instead of disappearing from sight so quickly. But that’s beyond our control. Or maybe Serena’s control. I guess I’m also annoyed at Serena for not contributing more of her excellence to what could’ve been a truly brilliant match. There were moments when the women played glorious, no holds barred tennis. But they were too few and far between. And while Azarenka showed me with the look in her eyes that she believed she could win this match, or at least die trying, I had no idea what the heck was going on with Serena Williams. Regardless of what Serena thinks, there’s a problem with being so intermittently focused during today’s final: her main threat to a US Open title in two weeks just got a large injection of belief ahead a potential re-match in Flushing Meadows. And given what happened there last year, that extra confidence might be all that’s needed for Azarenka to finish what she couldn’t do at 5-3 in the third set of the final last year. Definitely the better final of the two! Lets hope this was just a warm up…both ladies have looked well below A game all week….they both just seem to have something in them that won’t let them lose even if they don’t really want to win that badly… If that makes any sense at all. I don’t think that in Azarenka’s case the withdrawals greatly impact her overall record. She’s only withdrawn from two hardcourt tournaments (Brisbane and Indian Wells), won two (AO and Doha) and lost at one (Carlsbad) before Cincy. Sure 24-3 is worse than 24-1, but not by much. I do agree in general that not counting withdrawals as losses seems strange, but consider the reverse effect of this — every loss for Player A must be a victory for Player B. Maybe a walkover should count as a victory in the head-to-head matchups, but it seems unfair to count matches that were never played. I’d say a better plan would be to find some means of acknowledging walkovers in the win-loss record without counting them as wins or losses.